You can use food labels as a tool to plan healthful meals and snacks that meet CACFP criteria and the Dietary Guidelines. 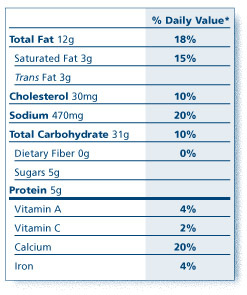 Food labels provide key information to help you select foods to serve for meals and snacks. This information includes health claims, nutrient content claims, an ingredient list, and the Nutrition Facts panel. Which Foods Have Food Labels? Most packaged foods have food labels. The U.S. government is responsible for assuring that they contain truthful and accurate information. The Food and Drug Administration (FDA) oversees the labeling of most food products. However, the U.S. Department of Agriculture (USDA) oversees products that contain mainly fresh meat and poultry. The common name of the product. The name and address of the manufacturer, packer, or distributor. The net content in terms of weight, measure, or count. By law, the ingredients on a food label must appear in a certain order by weight. The ingredient that contributes the most weight to the food appears first on the list. The one that contributes the least weight appears last. You can use this information to fine-tune your purchasing decisions. For example, you can check the list of ingredients in a loaf of bread to see how much of the flour is made from whole grains. If a whole-grain flour appears first on the list, the bread has a high proportion of whole-grain flour. If wheat flour appears first on the list, and a whole-grain flour is listed second, the bread has a lower proportion of whole-grain flour. 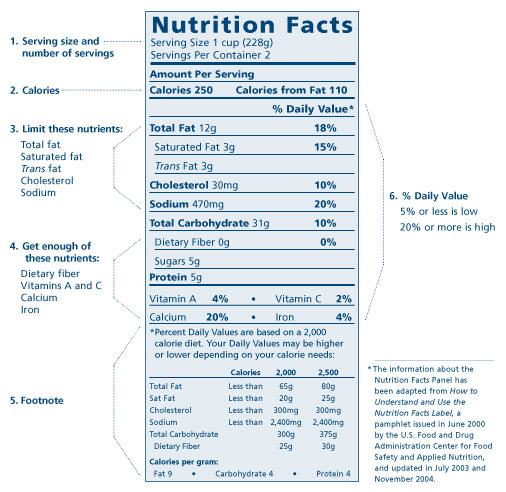 The Nutrition Facts panel provides valuable details about food products (serving size, number of servings, calories, and nutrient information). The footnote on larger food packages shows recommended daily intakes of certain nutrients based on 2,000 and 2,500 calorie diets. Serving sizes help you to compare similar foods. They appear in familiar units (such as cups or pieces), followed by the weight in grams (g) or milligrams (mg). The calories and amounts listed are for a particular size of a serving. Pay attention to serving sizes, especially to how many servings are in a food package. On the sample label below, 1 serving of macaroni and cheese equals 1 cup. If you ate the whole package, you would eat 2 cups. That doubles the calories and nutrients! Source: How to Understand and Use the Nutrition Facts Label. U.S. Food and Drug Administration, Center for Food Safety and Applied Nutrition. June 2000; Updated July 2003 and November 2004. Calories are a measure of how much energy you get from a serving of this food. The number of servings you consume determines the number of calories that you actually eat. In this sample label, there are 250 calories in 1 serving of macaroni and cheese. of these calories, 110 come from fat. Note that fat provides almost half the calories in 1 serving. Eating too much fat, saturated fat, trans fat, cholesterol, or sodium may increase the risk of heart disease, high blood pressure, or some cancers. Health experts recommend keeping intake of these nutrients as low as possible. Eating enough dietary fiber, vitamin A, vitamin C, calcium, and iron can improve health and help reduce the risk of some conditions. For example, calcium may reduce the risk of osteoporosis. Dietary fiber promotes healthy bowel function. A diet rich in fruits, vegetables, and whole grain products that is low in saturated fat and cholesterol may reduce the risk of heart disease. The * after the % Daily Value refers to the Footnote at the bottom, which tells you % DVs are based on a 2,000 calorie diet. This statement must appear on all food labels. The rest of the footnote may not appear if the label size is too small. The full footnote is consistent on products, and shows recommended dietary advice for all Americans. It is not about a specific food product. 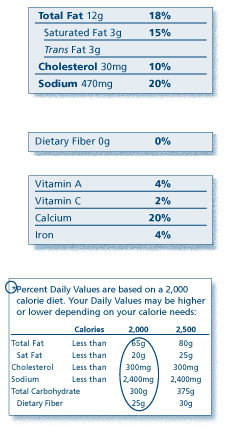 The circled amounts are the Daily Values (DVs) for each nutrient listed based on health experts' advice. DVs are recommended levels of intakes based on a 2,000 or 2,500 calorie diet. Note how the DVs for some nutrients change, while others (cholesterol and sodium) remain the same for both calorie amounts. Each nutrient listed has a Daily Value, a % DV, and a recommended dietary goal, based on a 2,000 calorie diet. The goal for some nutrients is to eat less than a certain amount. The goal for other nutrients is to eat at least a certain amount. % DV shows whether a serving of food is high or low in a nutrient, and how much it contributes to your daily allowance for this nutrient. % DVs are based on daily allowances for key nutrients for someone consuming 2,000 calories a day. For diets at other calorie levels, the % DV can still act as a general guide. You don't need to calculate % DV. The label does the math for you. It puts the grams and milligrams on the same scale for the day (between 0 and 100% DV). The rows in the % DV column don't add up to 100%. Instead, the % DV for each nutrient is based on 100% of its daily allowance. Comparisons: The % DV makes it easy to compare similar products or brands. Make sure the serving sizes are similar, especially the weight of each product. Nutrient Content Claims: The % DV can help you examine nutrient content claims that companies put on their products, such as reduced fat or light. Compare the % DVs on food products to see which product is higher or lower in the nutrient. Dietary Trade-Offs: The % DV can help you make dietary trade-offs with other foods over the course of a day. You can balance a favorite high-fat food with lower fat foods at other times of the day. Pay attention so the total fat for the day stays below 100% DV. Vitamins A, C, and D, iron, and calcium show a % DV, but not a weight. Use % DV for calcium to learn how much 1 serving contributes to the total amount needed per day. A food with 20% DV contributes a lot of calcium. A food with 5% DV contributes a little. The 100% DV for calcium is 1,000 mg based on a 2,000 calorie diet. Experts advise women after menopause to consume 1,200 mg calcium daily, which is 120% DV. If the food company makes a claim such as high in protein, it must list a % DV for that nutrient. There is no DV for sugars. Sugars listed on the Nutrition Facts panel include those that occur naturally in foods such as fruits or milk, as well as sugars added to foods or drinks. Check the ingredient list for the names of any added sugars. Added sugars include brown sugar, cane sugar, corn sweetener, corn syrup, dextrose, fructose, glucose, high fructose corn syrup, honey, invert sugar, lactose, malt syrup, maltose, maple syrup, molasses, sucrose, and sugar syrup. 1. 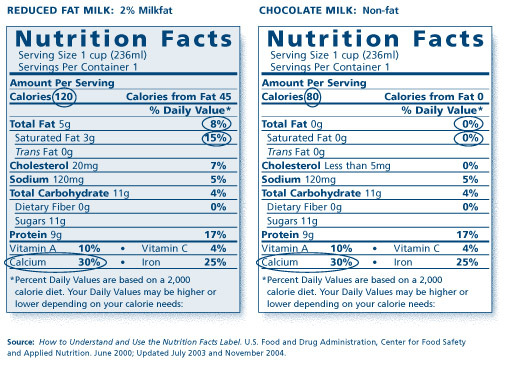 Compare the Nutrition Facts panels for 2% fat milk and non-fat chocolate milk. Each lists a serving size of 1 cup. Which milk has more calcium? Which has more calories and fat? Both kinds of milk have the same amount of calcium. One cup of 2% reduced fat milk has 40 more calories than 1 cup of chocolate non-fat milk. One cup of 2% reduced fat milk has 5 grams of total fat and 3 grams of saturated fat. There is no fat in 1 cup of chocolate non-fat milk. 2. 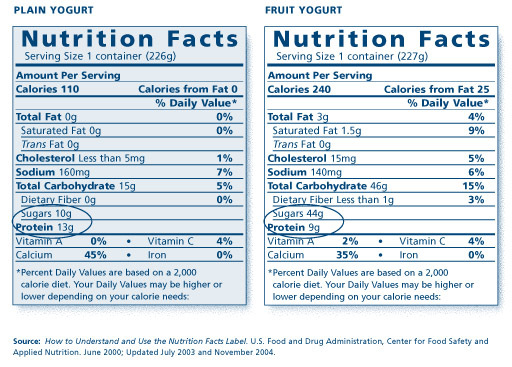 Compare the Nutrition Facts panels for the two sample yogurts. What is the serving size for each yogurt? How do they compare in terms of protein and sugar? The yogurts come in containers with similar serving sizes (226 or 227 grams). The fruit yogurt has less protein and more sugar. 3. 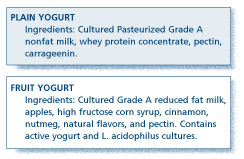 Compare the ingredient lists of the two sample yogurts. Why does the plain yogurt have any sugar? What are the sources of sugar in the fruit yogurt? The plain yogurt has a naturally-occurring sugar (lactose) found in milk. The fruit yogurt has 3 sources of sugar: the lactose in the milk, the naturally-occurring sugar in apples, and an added sugar (high fructose corn syrup). To limit added sugars, compare labels of similar products and choose the food with the lowest amount. Check ingredient lists to see if any added sugars are listed. The Nutrition Labeling and Education Act of 1990 allows certain health claims about the relationship between nutrients and a reduced risk for certain diseases. Examples of currently allowed nutrients are listed below. Diets ADEQUATE in these foods or nutrients can help reduce the risk. Source: A Food Labeling Guide. Appendix C. U.S. Food and Drug Administration, September 1994. Editorial revisions June 1999. Government regulations state which terms may be used to describe the levels of nutrients in foods, and how they can be used. Free The reference amount contains none of the nutrient claimed, or less than 5 calories, 5 mg sodium, 0.5 g total fat. 0.5 g saturated fat, 2 mg cholesterol, or 0.5 g sugar. Low The reference amount has no more than 40 calories, 140 mg sodium, 3 g total fat, 1 g saturated fat, or 20 mg cholesterol. Lean The reference amount of meat, poultry, or seafood contains less than 10 g total fat, 4.5 g saturated fat, and 95 mg cholesterol. Extra Lean The reference amount of meat, poultry, or seafood contains less than 5 g total fat, 2 g saturated fat, and 95 mg cholesterol. High The reference amount contains 20% or more of the Daily Value (DV) for a particular nutrient. Good Source The reference amount contains 10-19% of the Daily Value (DV) for a particular nutrient. Reduced or Less The reference amount of an altered food has 25% less calories, total fat, saturated fat, cholesterol, sodium, or sugars than a reference food. Reduced cannot be used if the reference food already meets the requirement for a low claim. Light or Lite An altered food has at least 1/3 less calories or less than half the fat found in a reference food. If at least half the calories come from fat, the food must have at least 50% less fat per reference amount. If less than half the calories come from fat, the food must have at least 50% less fat or 1/3 less calories. or The sodium in a low-calorie, low-fat food is reduced by 50%. or Light can describe properties such as texture and color, as long as the label explains the intent (for example, light and fluffy). More One serving has at least 10% more of the Daily Value (DV) of a nutrient than a reference food. May only be used for vitamins, minerals, protein, dietary fiber, and potassium. % Fat Free A product must be low-fat or fat-free. The claim must reflect the amount of fat in 100 g of a food. A “95% fat-free” food has 5 g fat in 100 grams of food. No Added Sugars No sugar or sugar-containing ingredient is added during processing. Healthy A food that is low in fat and saturated fat, and contains minimal amounts of sodium and cholesterol. One serving has no more than 360 mg sodium for an individual food, 480 mg sodium for a meal, and no more than 60 mg cholesterol. In addition, a single-item food must provide at least 10% of the DV of 1 or more of vitamins A or C, iron, calcium, protein, or fiber. A meal-type product such as a frozen entree must provide 10% of 2 or 3 of these vitamins, minerals, protein, or fiber. Fresh A raw food that has not been frozen, heat processed, or otherwise preserved. Fresh Frozen A food that has been quickly frozen while still fresh. Source: A Food Labeling Guide. Appendix A and B. U.S. Food and Drug Administration, September 1994. Editorial revisions June 1999.